As much as it regrets me to say it, I think we’ve had this season’s final harvest from our garden. We’ll probably get a few more random veggies, but the last big one has come and gone. I decided to pull most of the produce because of the unpredictable weather. Although the temperature climbed into the 70s today, the Weather Channel predicted an overnight low of 30 degrees last week. In fact, October 15 is the average first freeze at Dulles National Airport in Virginia, while October 29 is the average first one at the Baltimore Airport. (Which I find odd, because Dulles is much further south, but Baltimore’s proximity to the harbor must warm it up a bit.) While it may have been a little early, I didn’t want to wake up and find all of my vegetables cracking, half-frozen, and inedible. I figured it was better to be safe than sorry. While there are plenty of fall vegetables that survive through early frosts, we currently don’t have any after the bugs sucked dry my butternut squash. My haul consisted of a large bowlful of yellow cherry tomatoes, five large to medium eggplant, four red peppers, a couple of green peppers, some green tomatoes that never ripened, and a bunch of basil leaves. Besides the surprise success of the peppers, the eggplant was the real winner this year. Like the peppers, it’s a plant I love that I’ve tried to raise from seed in the past and thoroughly failed. This year, I gave into buying seedlings at the farmers’ market and planted them. Although they were looking pretty peaked at first, they ended up strong and producing an incredible amount by the end. Beyond the mere number of veggies, the size was overwhelming. They grew quickly and ended up far larger than the ones you see in the grocery store. I love eggplant, but I’m seriously wondering what to do with all of it! Chris has made eggplant puree a few times and I’ve used it over pasta more times than I can remember. I even made a huge casserole dish of my favorite meal, eggplant parmesan, so we have a freezer full of it, perfect for a winter lunch. The Stonyfield Greek yogurt I recently bought has a great recipe under the foil seal for roasted eggplant, Greek yogurt, and chickpeas that I’m hoping to make this weekend. Even after that, we’ll still have three more eggplant in the fridge. 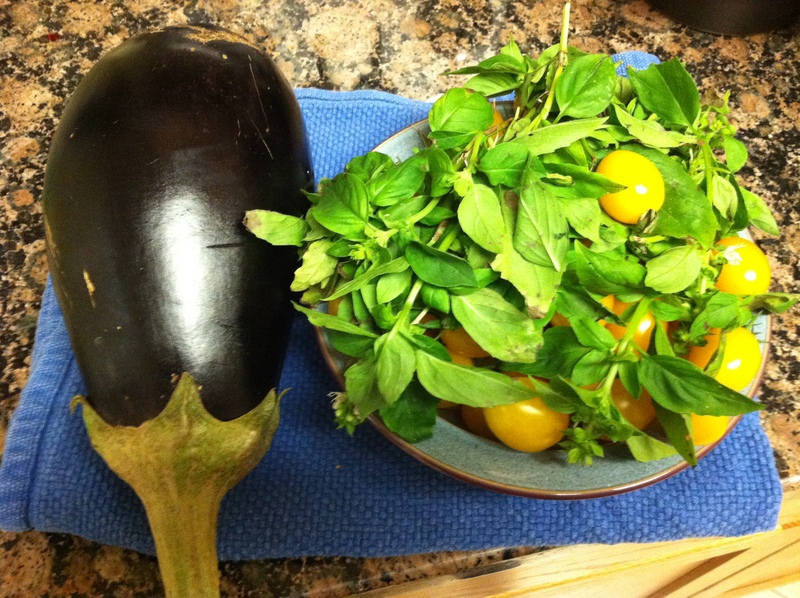 While the eggplant is taking up a lot of room, the basil was a more urgent concern. By the time I stripped it of most of its leaves, it had shed a number of them. The tomatoes always overshadowed it, which meant that the plant never grew well in the first place. Then, I neglected consistently picking off its flowers. When basil goes to seed, the plant starts turning woody and stops producing its leaves. Instead, they turn brown and black. So before the leaves turned completely brown in my fridge, I made pesto. To use up both the pesto and a pepper, I combined them together into an excellent dish. It even has quinoa in it, the favorite grain of Peruvians, and a great vegetarian source of protein. While I’m disappointed that I never got around to planting fall vegetables – I meant to plant spinach for about a month – I was happy with the harvest we had. I’ve eaten something from my garden nearly every day for the last month, which is always a great feeling. Ricotta cheese (if it’s fresh ricotta, you may want to drain it ahead of time) – the amount depends on the size of the pepper. 3) Mix the cheese and pesto together, and then mix in the walnuts, spinach, and quinoa. Salt and pepper the mixture. 4) Cut the very top off of the pepper, to create a little cap. 5) Salt and pepper the inside of the pepper. 6) Stuff the mixture into the pepper and replace the top. 7) Roast the pepper in the oven for about 45 minutes, or at least until the pepper shrivels and the inside mixture is hot. Have you done the final harvest of your garden yet? Do you have any great eggplant recipes? 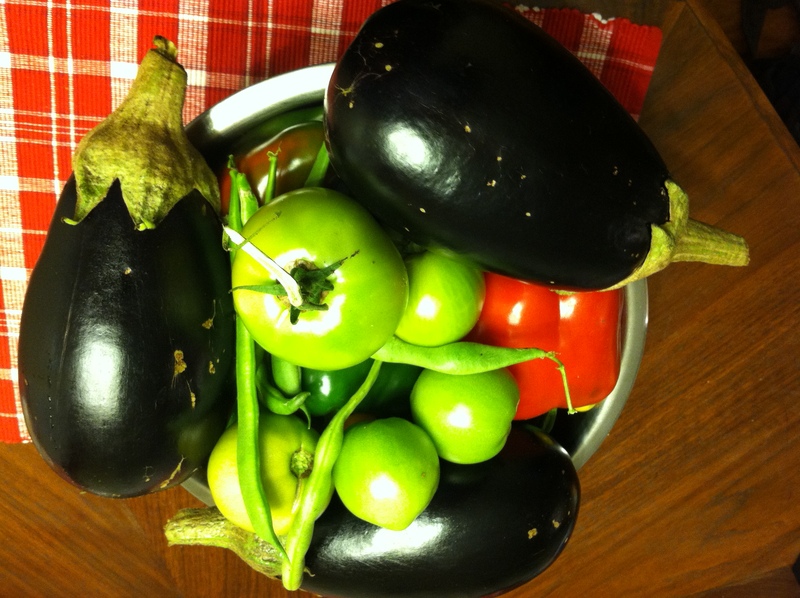 This entry was posted in cooking, family, food, gardening, recipe and tagged eggplant, gardening, harvesting, recipe, red peppers, stuffed peppers, vegetarian. Bookmark the permalink. Well, you could try a curried eggplant –just stirfry with some green curry paste, with onions, garlic and tomatoes. Right there’s a gentle snowfall in our area. Thank goodness before snow fell, I peddled home quickly from the farmers’ market with my butternut squash, plums, red onion and peppers. Good idea! I just made a curried butternut squash but eggplant is good too. And biking in the snow isn’t fun, so I’m glad you made it home in time.